I keep making much to much starter and my fridge has been littered with glasses and jars of left over starter. I had one left to use up and this is what came out. I had 100 grams of starter that hadn't been fed in a week and no plan. It kind of all worked out. 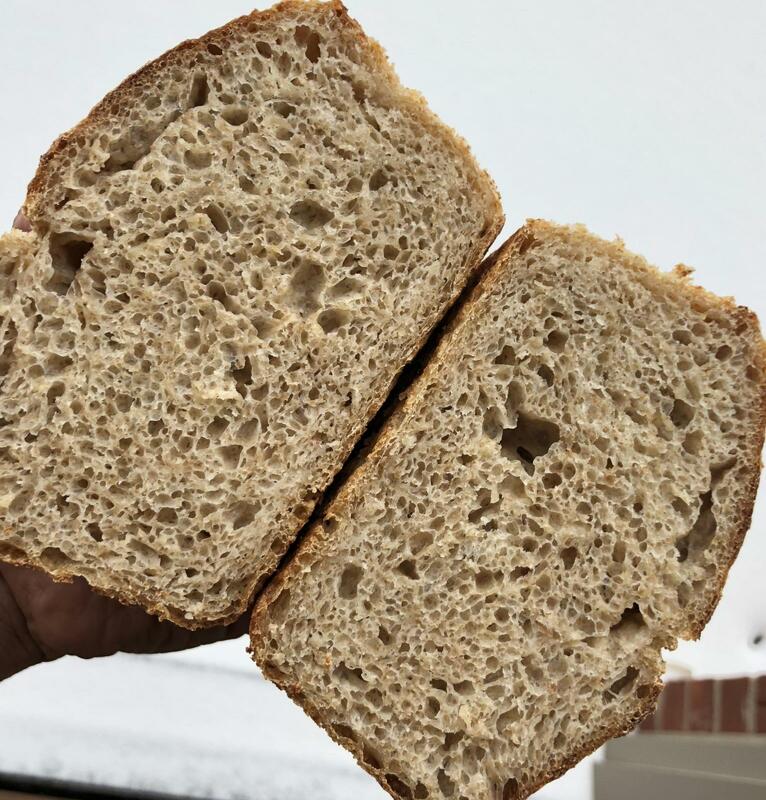 I fed it 1:1:1 and then added another 600 g of water and 800g of unbleached bread flour as that's all I have in the house right now. 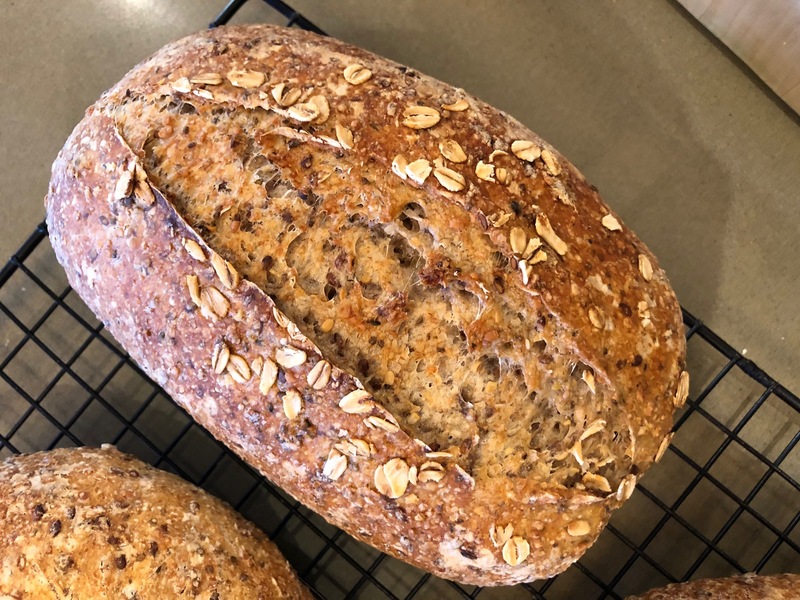 Based on last week's bake and the impact oat bran had on creating a soft crumb I decided to add some steel cut oats to this bread. I added 100 g with 70 g of very hot water to soak while I got everything ready. I then thought about all the posts I see with rice so I thought I'd use some red rice I had and cooked, cooled and then added 125 g of that too. 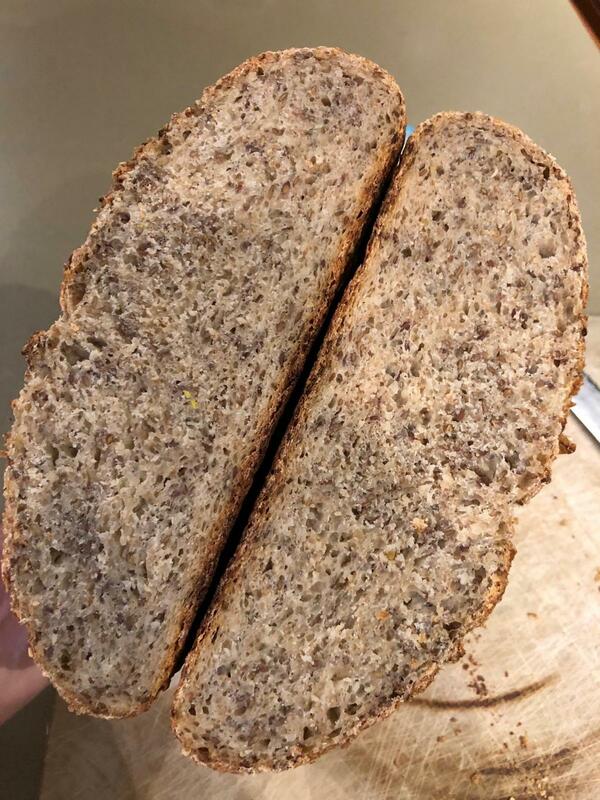 I was hydrating some old and too try almonds and thought why not - so they were thrown rough chopped and added too at 40 g. Thinking of Sarah Owen's spelt honey oat bread I've made in the past I decided to also add 50 grams of local raw honey to the bread too. 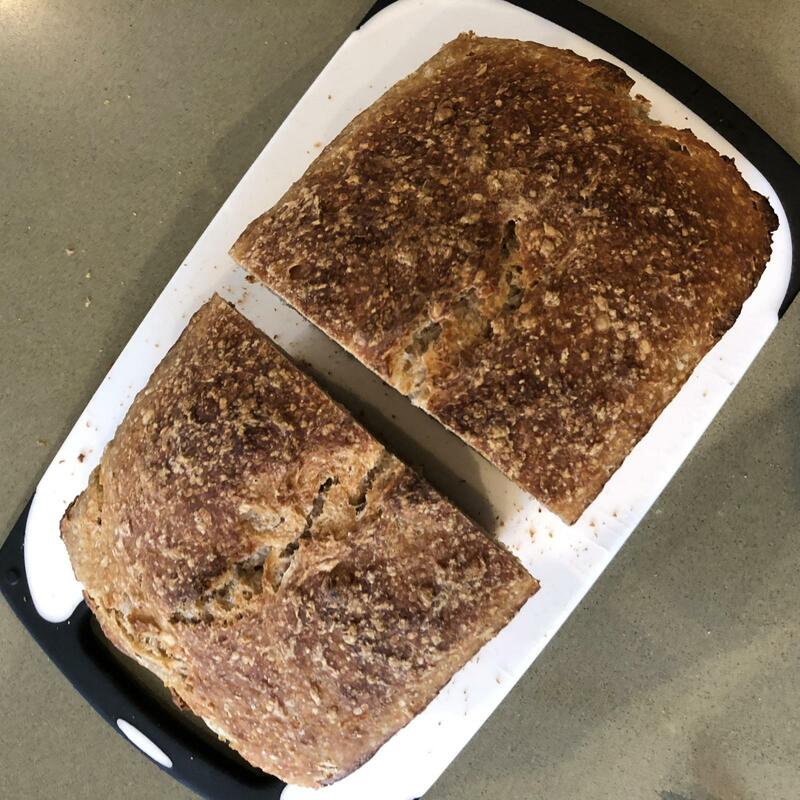 All in the recipe turned out to be (inclusive of the starter) 100% bread flour, 86% water, 13% cooked red rice, 10.5% steel cut oats, 5% honey, 4.5% hydrated almonds chopped and 2.1% salt. 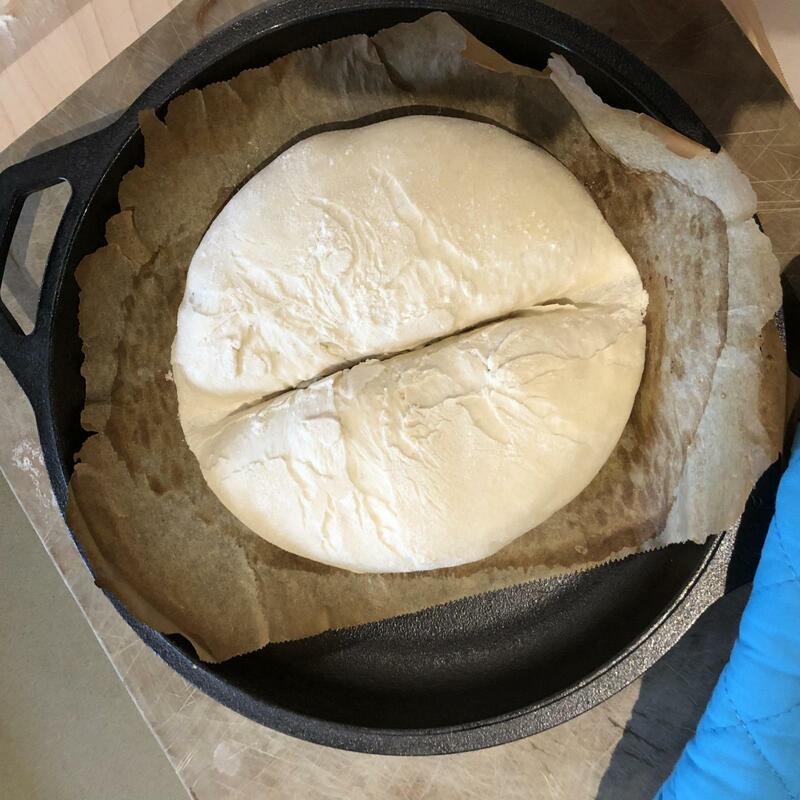 I started making the final dough around 5pm yesterday afternoon, used a proofer box and didn't get to shape them until about midnight - by then the dough had doubled. Ideally this was a same day bake given the amount of starter, but it was late. Into the cold until this morning - 10 hours later. They were left too long before the bake but didn't fully collapse on me. I baked them in a dutch oven that was a bit small for how much they had expanded by morning. 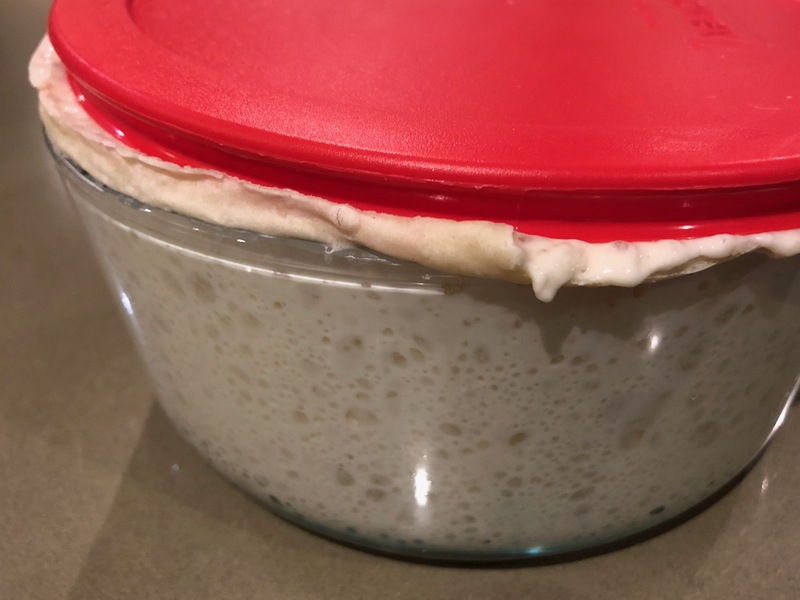 This was a VERY sticky dough and hard to work with - very slack because of the hydration and I didn't have time to develop much structure. Next time I'd bake same day, work on creating more structure with folds, I'd double the almonds, reduce the hydration to about 75% and maybe increase the honey to 7.5% given the rice is a bit bitter. That said, this has a very nice firm crumb that has a great resistance when being pulled apart and a nice mouth feel. It's nicely moist, and on the edge of too moist but isn't. I'd play with this idea again at some point. I threw some flax seeds on the bottom of the baskets too. 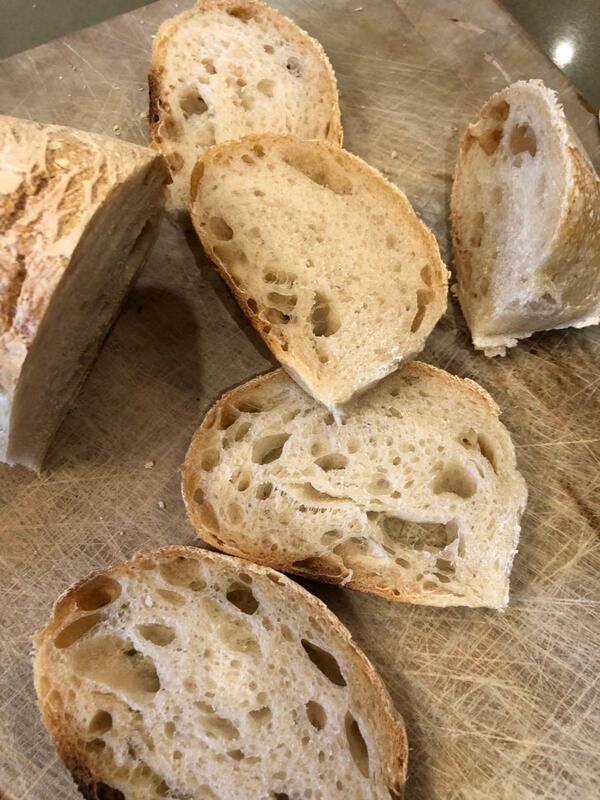 Considering I used a week old starter without a feed build-up and no plan, I'm happy with it! 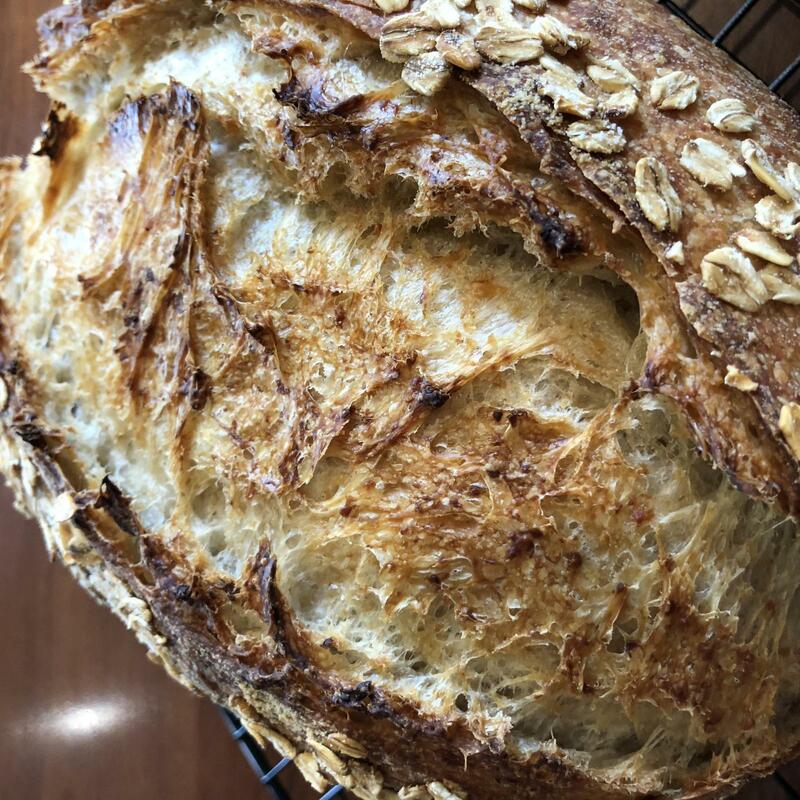 Read more about Tartine dedication..
Life's been complicated the past many months as I've been caring for my mom as she's approaching the end of her life. She's approaching the final runway and talking to the control tower waiting for the all clear. 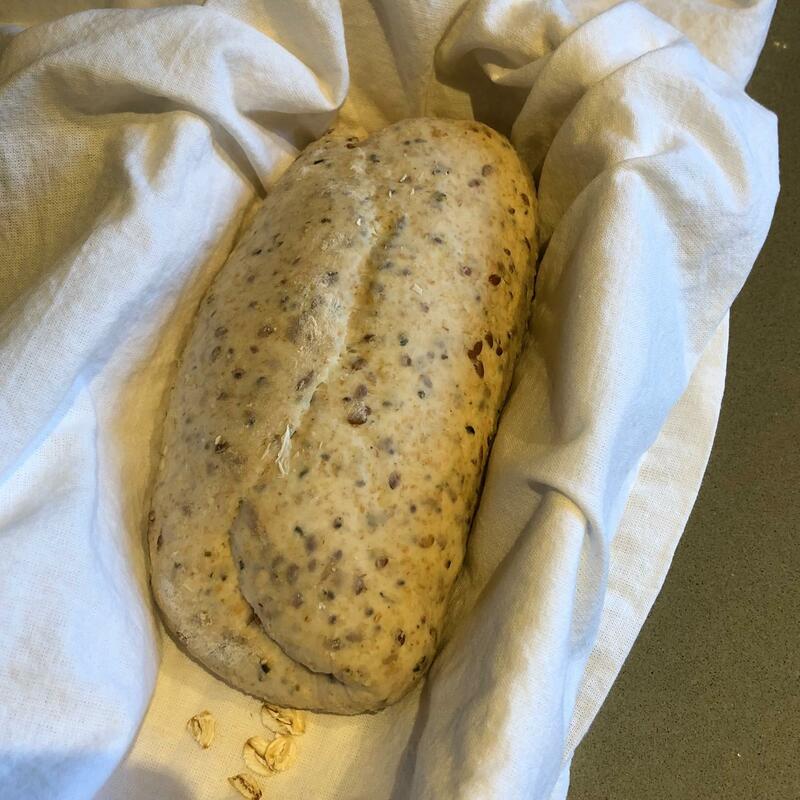 It's been a long journey and most of the joy in life has been zapped out of me for now while we go through this.. so I've not been making much bread and don't recall that last loaf I made at some point in the spring. 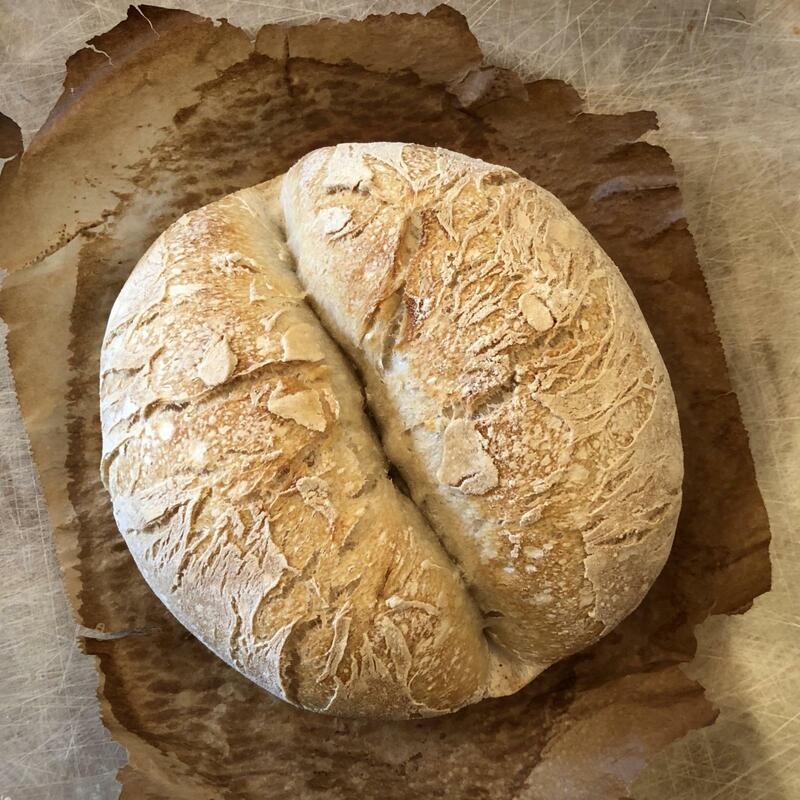 Reading everyone's bread forum entries has been a good distraction this summer - you're all to be applauded for your enthusiasm and dedication to the craft of bread baking. I'm posting tonight because I've just pulled one out of the oven a few minutes ago and wanted to share the story behind it..
Long before my mom's health turned for the worse early in the year I committed to becoming a beekeeper to offset the routine of life as a corporate suit with a part time bread passion.. I signed up for a local apprenticeship program and not being one to take it slow decided I may as well get my own hives right out of the gate.. (not exactly the best way to go about this as a novice - but it's been very rewarding and honey bees are good teachers!). First up.. my two hives after being installed.. they sit on a roof top over-looking a cricket pitch.. 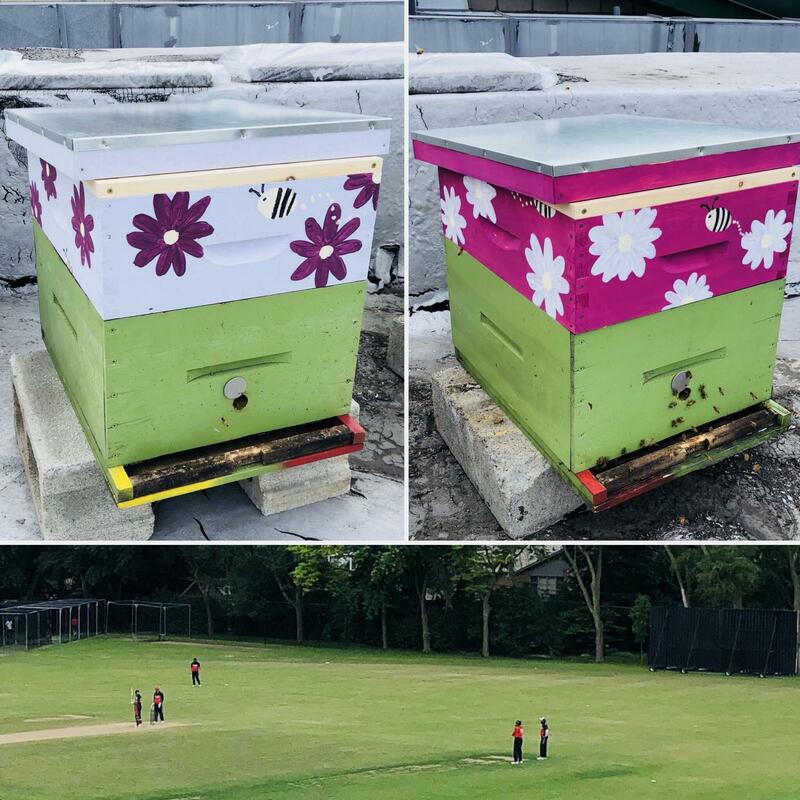 The colorful painting of the honey supers (the upper boxes on each hive) was done by my daughter.. This picture was taken just after the hives were installed. A few months later (about two weeks ago) I pulled a few honey frames out to extract some honey. 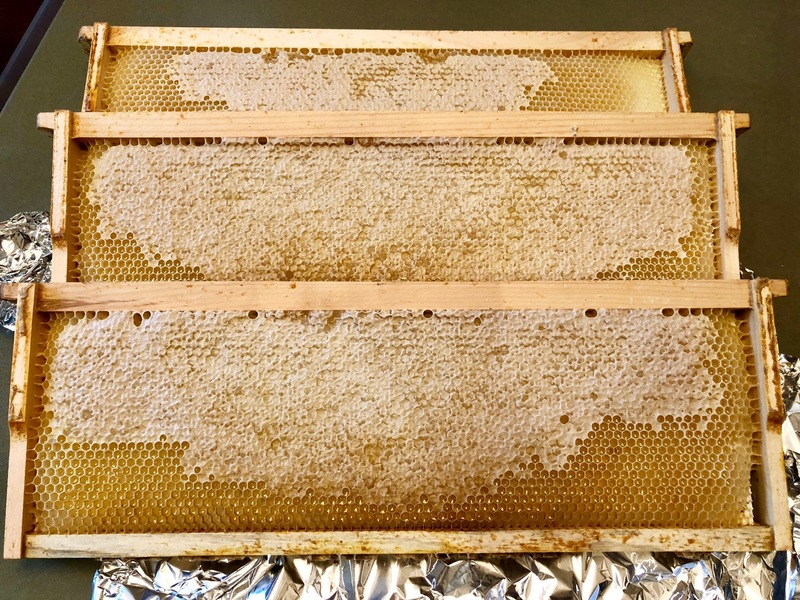 Admittedly a bit premature (not all cells were caped in the frames) given it was their first year, but I really wanted to taste early summer honey (lighter colored and more delicate tasting than fall honey). So I only pulled out three frames.. I spun them out at a friends place and they yielded some great tasting honey! Did you know that in it's lifetime, the average honey bee can only produce about a teaspoon of honey? But here's the thing.. the honey that was spun out gets poured into a food grade white pail from which I filled up my jars. And as I was trying to pour out the last bit of honey int he pail, there still was a thin coating of honey on it that the spatula left behind. I didn't want to just wash it out - thinking about how hard those bees worked to make this honey. 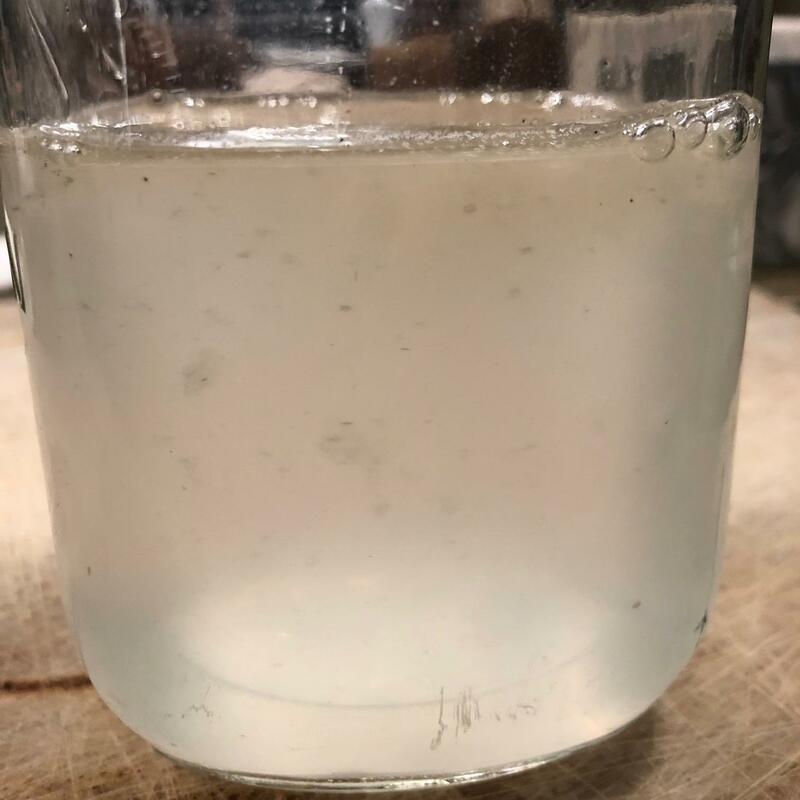 So I spontaneously decided to add a few cups of water to the pale to rinse out and collect that honey which I then poured into a clean mason jar. I put the cap on it and left it by the kitchen window to see if I could get some wild yeast to develop. I've never made raisin water and figured this would be sort-of the same idea. About five days later I had some great smelling hooch! 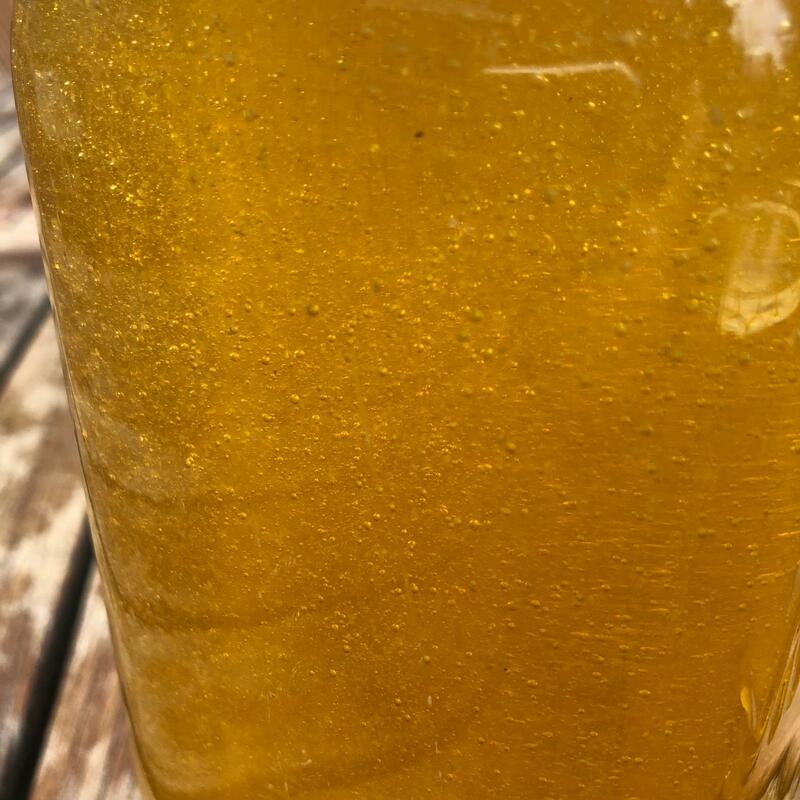 The honey started fermenting (this is how they make honey wine), some bubbles started forming and it gave off the sweetest smell of peach blended with alcohol. In the picture below I swirled the water a few times so you could see the yeasty bits float around. At this point I took about 100g of this water and mixed it with 100g of whole wheat flour and left it over night. It definitely started to develop as I had some rise the next morning. 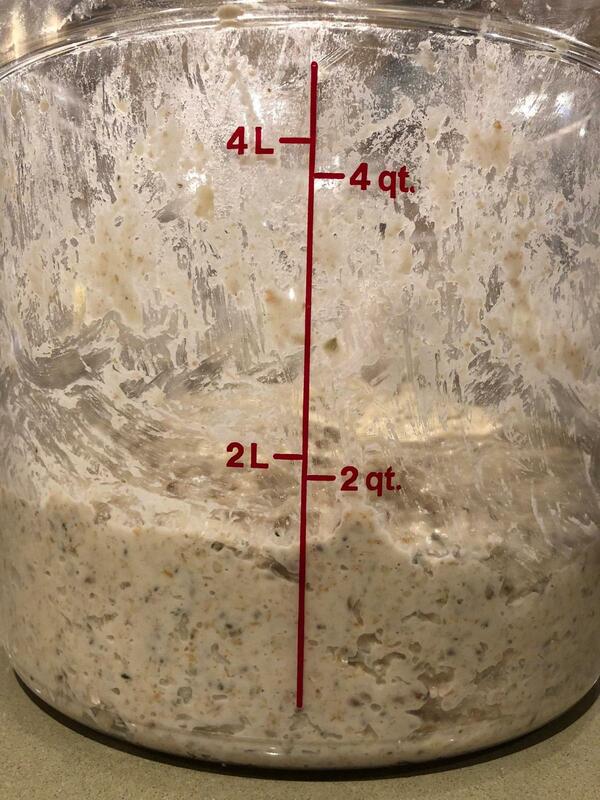 I then refreshed this starter and gave it another 50g each of more water and flour and had a triple before noon. And with that I had a peachy, honey, alcohol smelling starter on my hands.. (sorry no pics of it).. 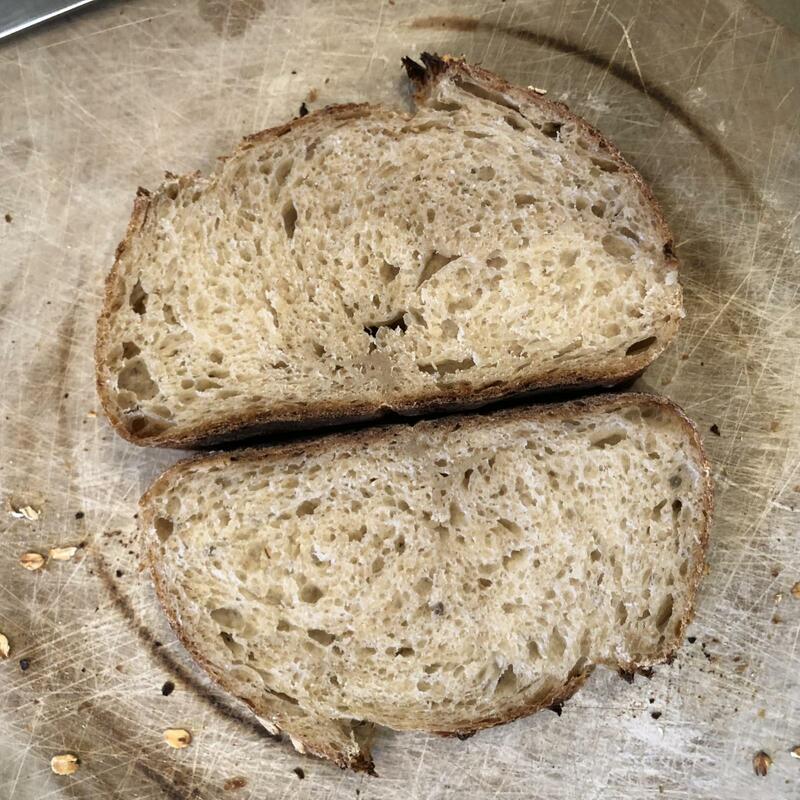 I then followed this recipe https://www.sourdoughandolives.com/recipe/how-to-make-and-bake-with-raisin-yeast/ I found online to make a levain (without the use of raisins of course) and made some bread dough.. 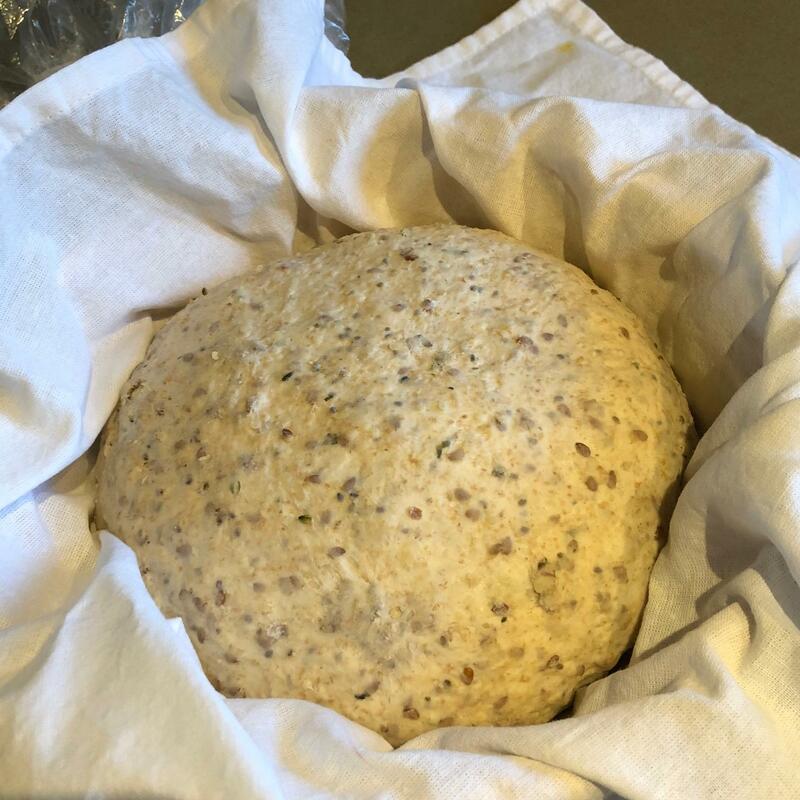 I mixed the levain Saturday and made the final bread dough yesterday. 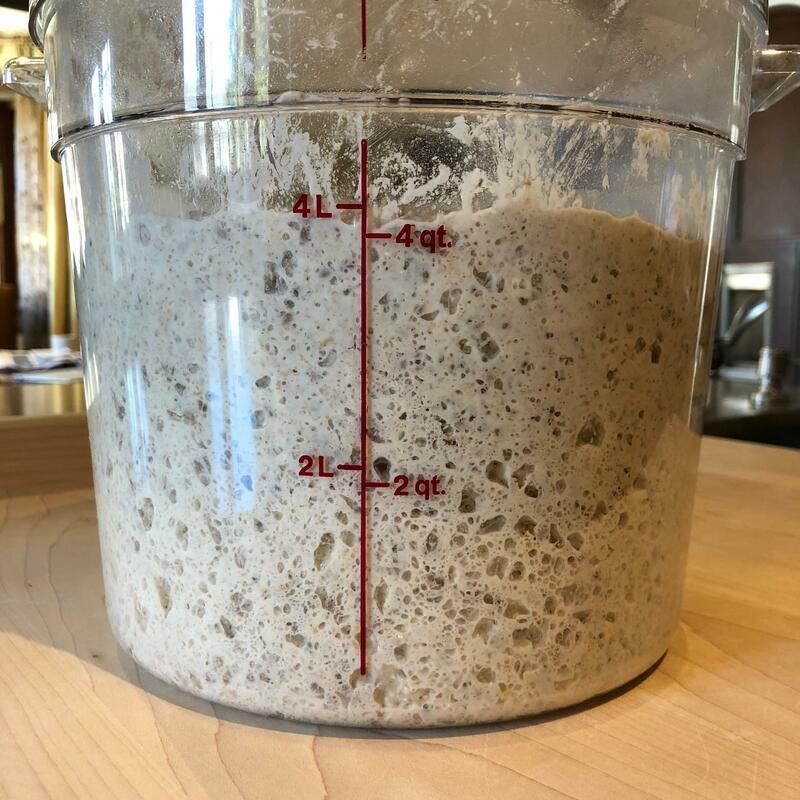 Life got in the way again and I had to leave the dough in the fridge overnight for an extended bulk and only earlier tonight did I have a chance to shape it and let it proof at room temp. 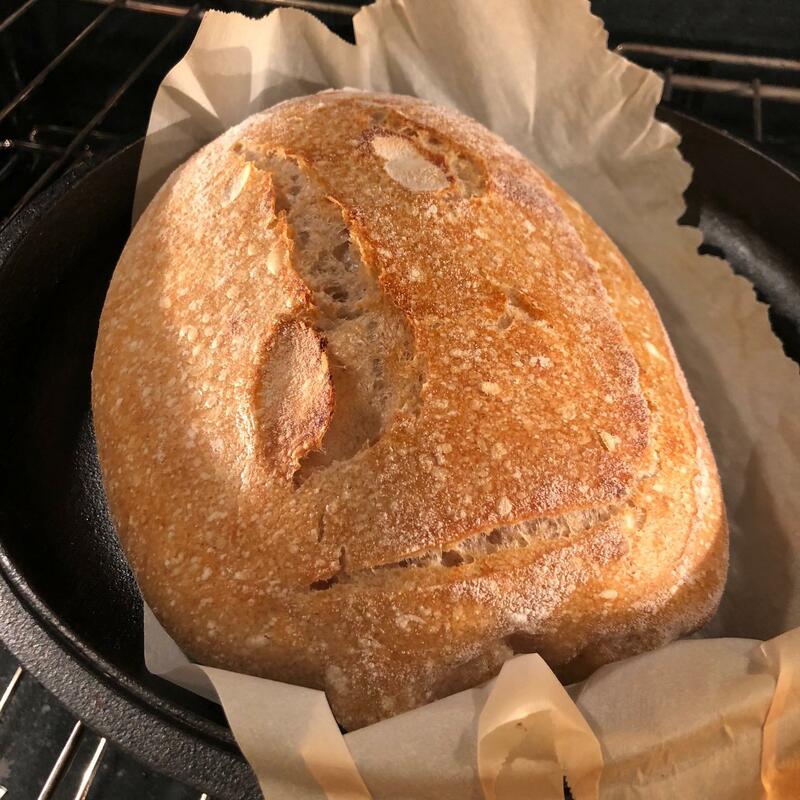 I didn't get a full double of the dough in the proof basket (maybe about 50%).. so it's a bit over proofed.. but here was the final bread just before I pulled it from the oven.. I don't suspect the crumb will be much to look at, but I'm looking forward to giving it a taste to see if any honey flavor was passed along in the process.. 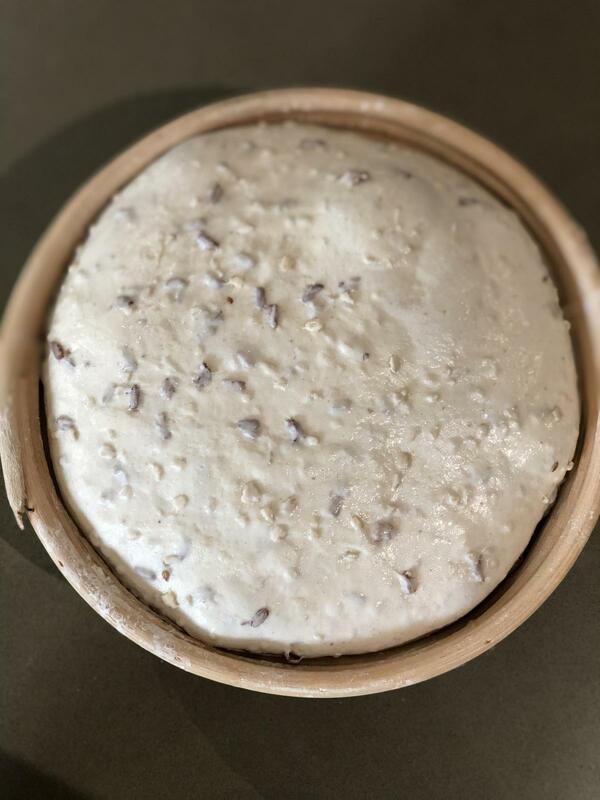 This was a good experiment and proved to me that there's never an excuse for not making bread when you can harvest wild yeast so easily! Read more about Charlie and fendue.. 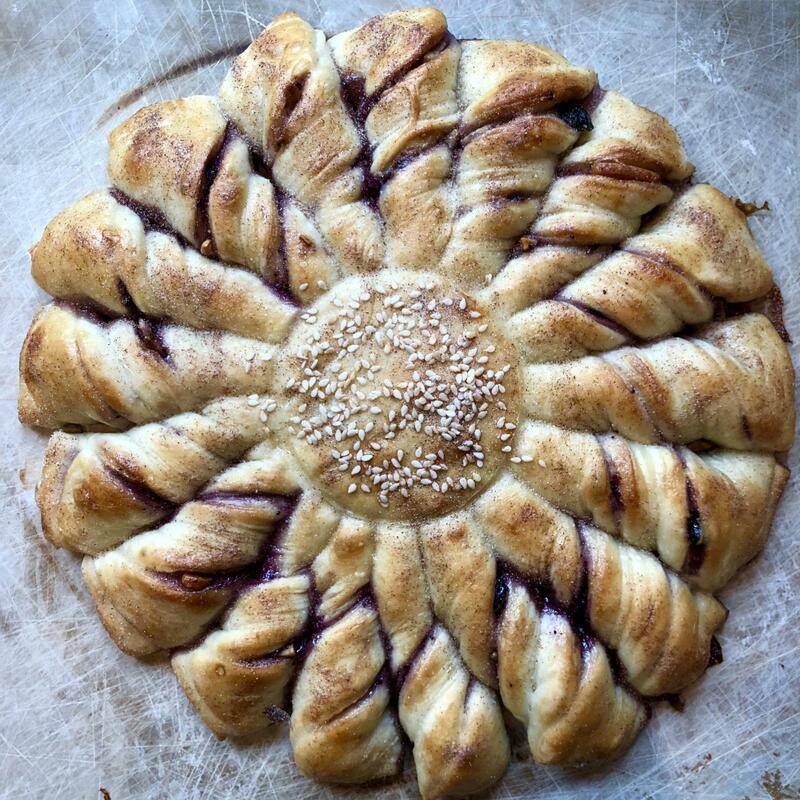 Someone somewhere on the site posted the suggestion of a summer solstice bread challenge. This is my answer to that call. 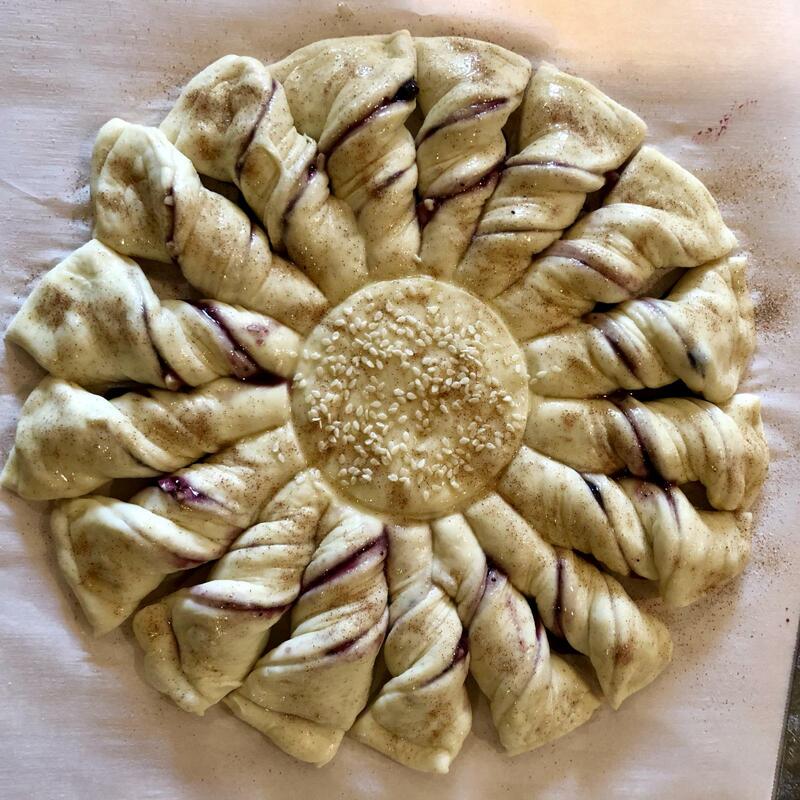 It's a sourdough summer solstice sun twirl with Ontario Maple Syrup, Quebec wild blueberry jam, sugared almond slivers and topped with cinnamon sugar. Happy summer to all..
Life's gotten the better of my time lately and Charlie's been well neglected in the fridge.. but thankfully he doesn't mind.. that said I decided to send him on journey and now part of Charlie is baking up a pizza storm in Virginia Beach with a good friend of mine.. 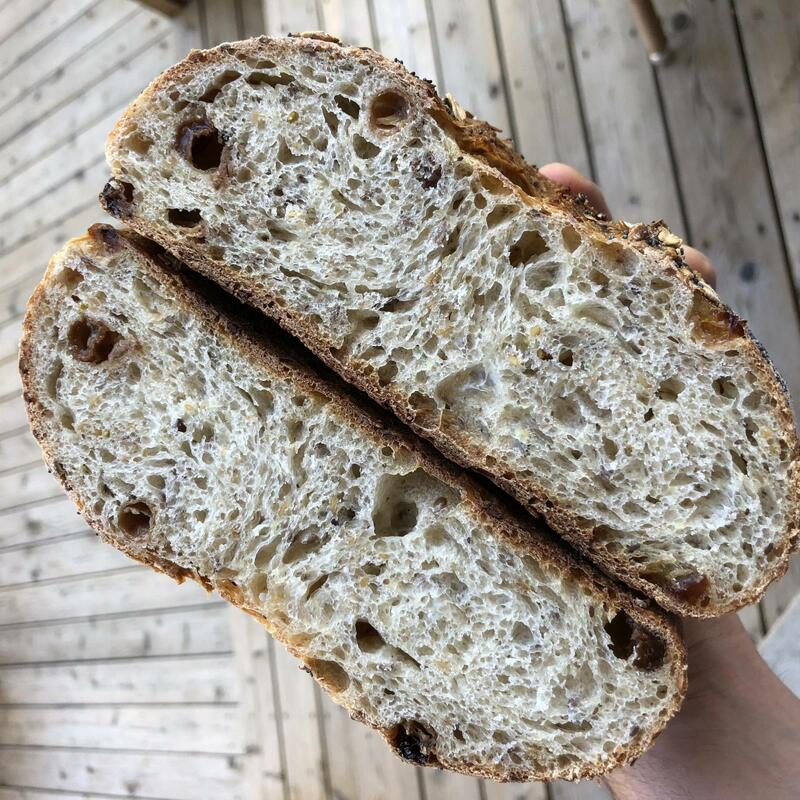 Meanwhile, I finally got around to baking last week and made a Tartine whole wheat loaf and made Danni's version of the Swiss Raisin Muesli bread that I've been trying to replicate. 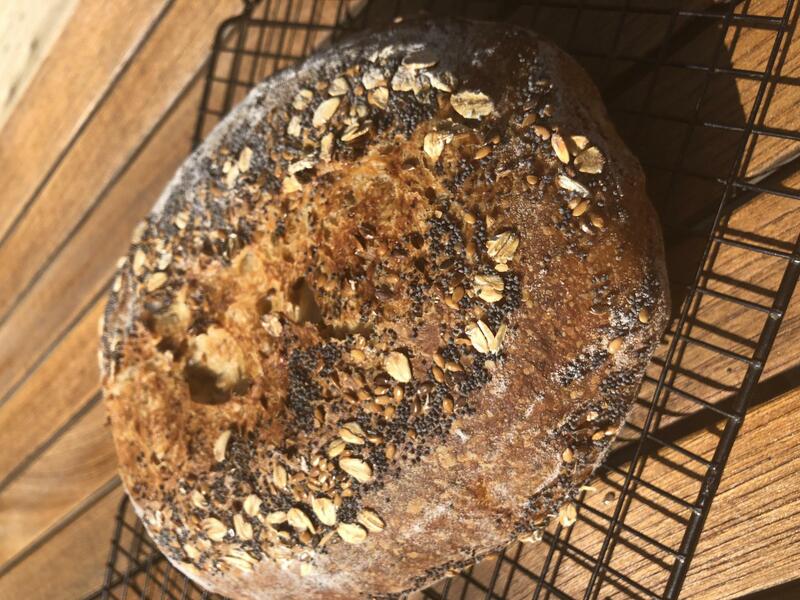 Danni - great recipe..
First the Tartine - standard recipe crusted with oat bran..
By all accounts a great bread and what seems like a fool proof recipe..
And below is the swiss raisin muesli.. It was a good replica of the original but not yet there. I forgot to dig out my bread lame and after I put the loaf on the combo cooker bottom ended up scrambling and grabbed a knife and butchered a score before putting the lid on. Oh well.. regardless the bread spread out more than i thought it would. Not sure why.. I don't think it was from the score, or that I over proofed/retarded it. The taste was good but more subtle compared to the original. I think I'll double up the raisin water, the honey and the raisins.. and see how that works. I also think I might add a bit more oil. 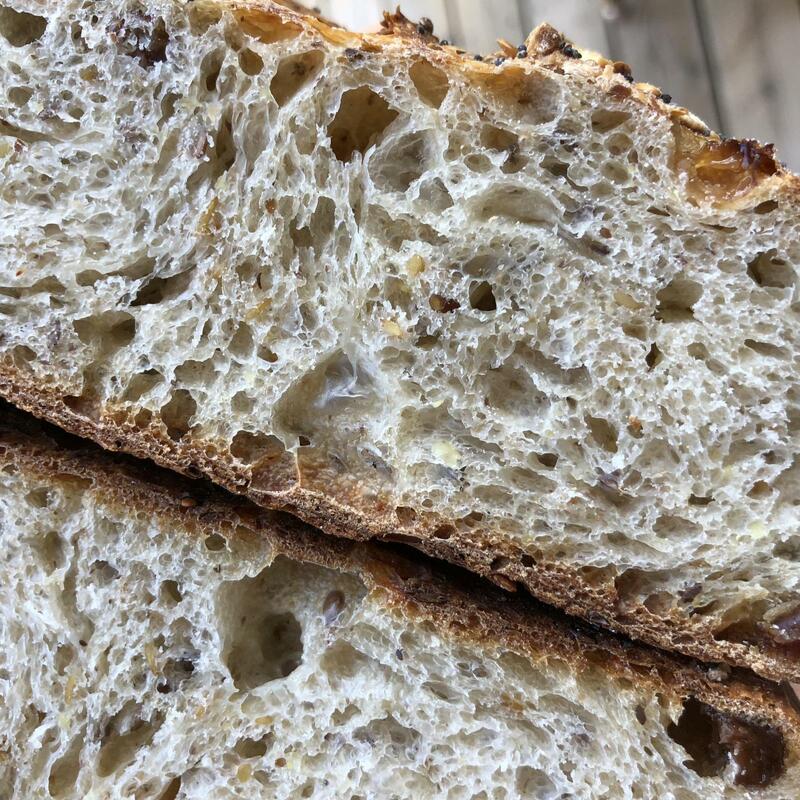 Read more about Swiss Raisin Museli - with a little help from my friends..
All Is (not) Lost.. first let me say that I'm referring to this weekend's bake and the movie by a similar name - All is Lost with Robert Redford (100% rotten tomatoes in my book). 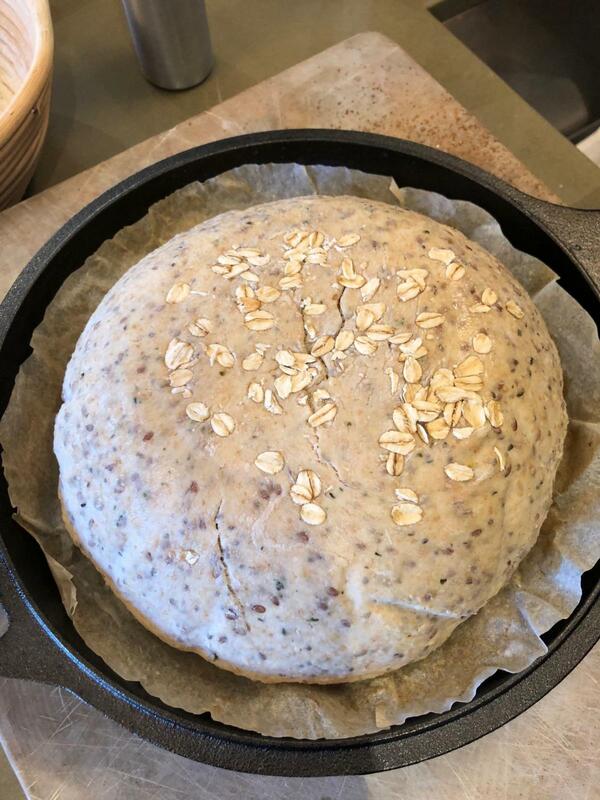 Last week I made a Honey Oat Loaf with all purpose, bread and a tiny amount of whole-wheat flour. 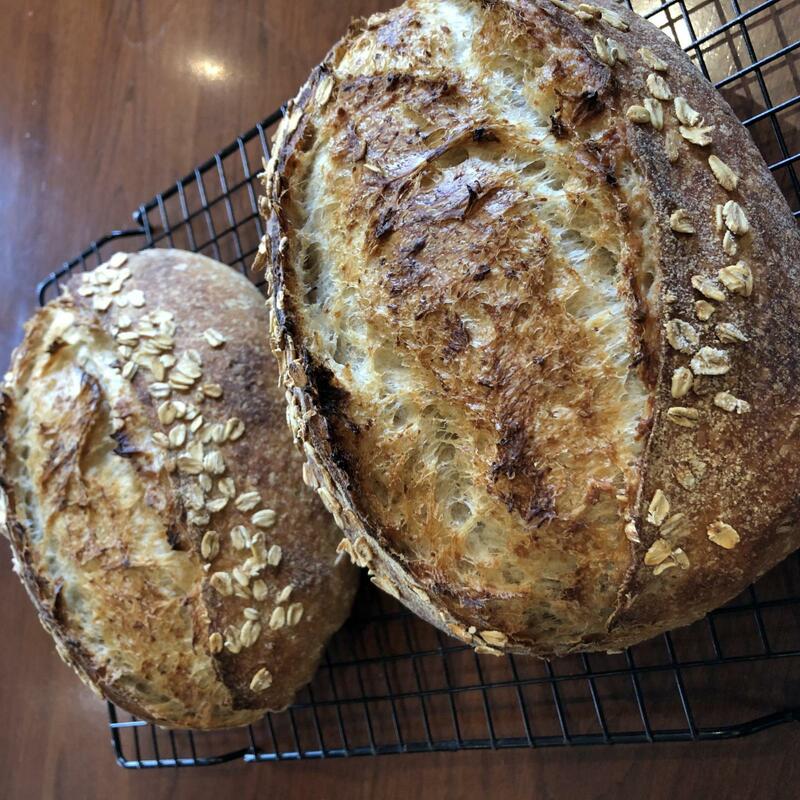 This week I decided to use Canadian maple syrup as the sap is flowing in these parts and amp'd up the whole wheat flour and hydration as I always find that loaf a bit dry to handle. 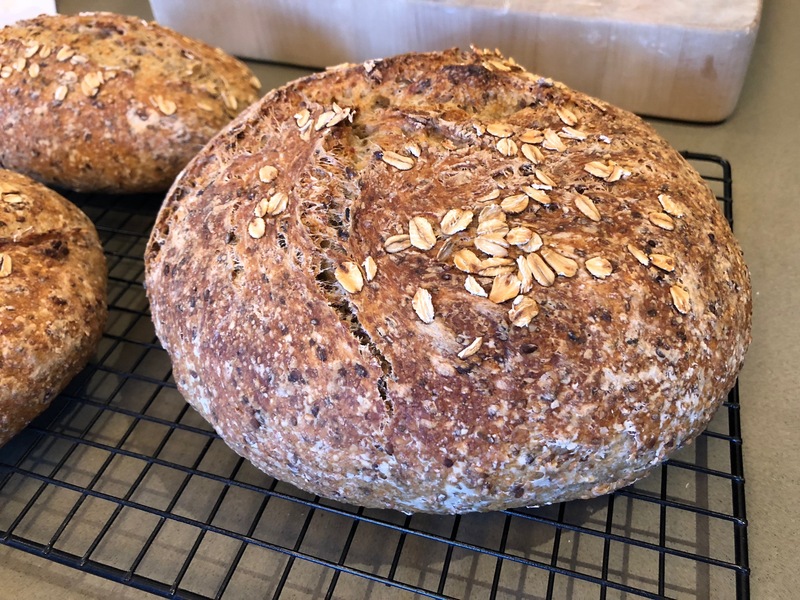 I also thought I should increase the hydration given the increased whole wheat flour content. I prepared the overnight soaker using 70g flaked oats and 140g boiling water. And fed my very active starter at the same time with 100% hydration using AP flour. 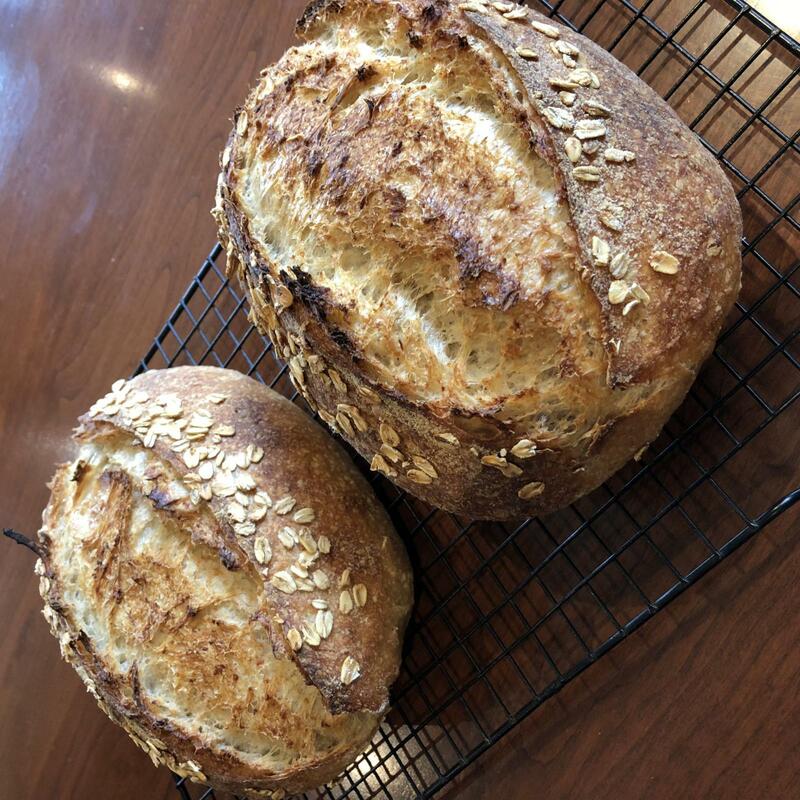 I also gave the flour an overnight on the counter autolyse using 115g bread flour, 90g whole wheat and 20g AP flour (total flour 225g) with 165g of warm water (hydrated to 73%). Including the water in the oats, the dough hydration was about 135%. I'm not sure if you calculate the hydration differently when using a soaker (anyone?). 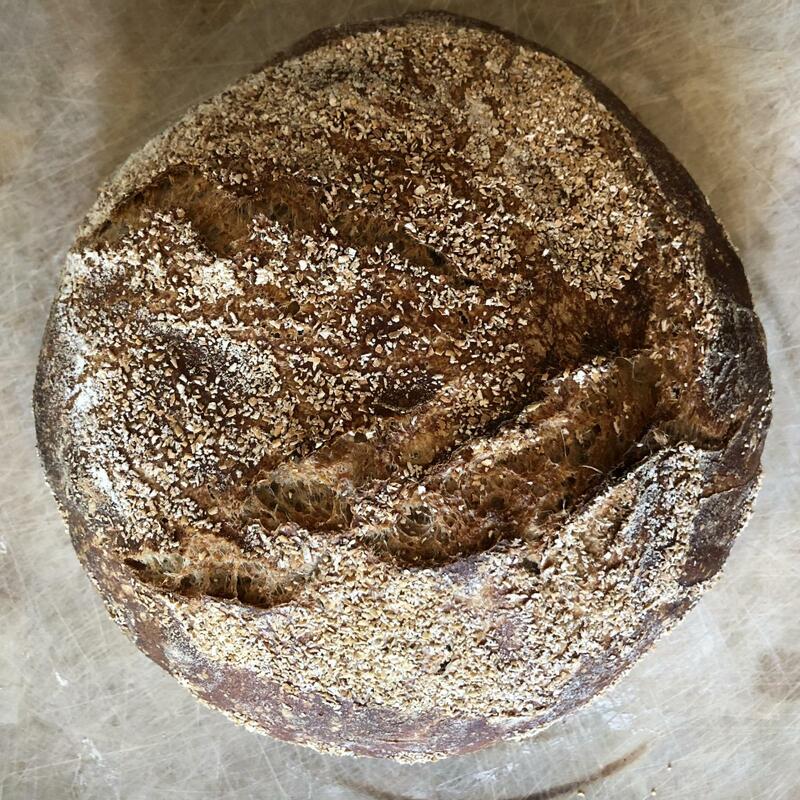 The next morning I combined the soaker, with 20g of maple syrup, 6g salt, 55g of levain and the hydrated flour. It was pretty soft and sticky so I thew it into the mixer for five minutes at medium until I got a windowpane. 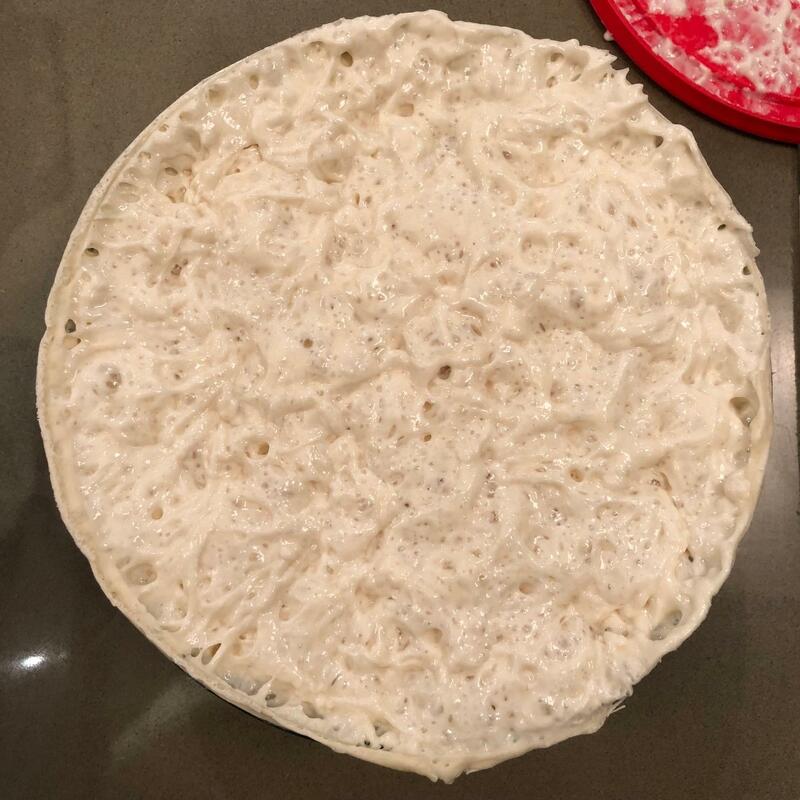 The dough was very silky to handle. Over the next three hours I gave it about four stretch and folds. I then let it sit for about six hours until it doubled. I tried to be gentle but it mostly deflated as I poured it onto my bench. It was very tacky so my attempts at a good pre-shape were useless. I decided to pour it into a Pyrex loaf pan and threw it into the fridge. Indeed, all was not lost. I'm surprised it turned out edible at all. 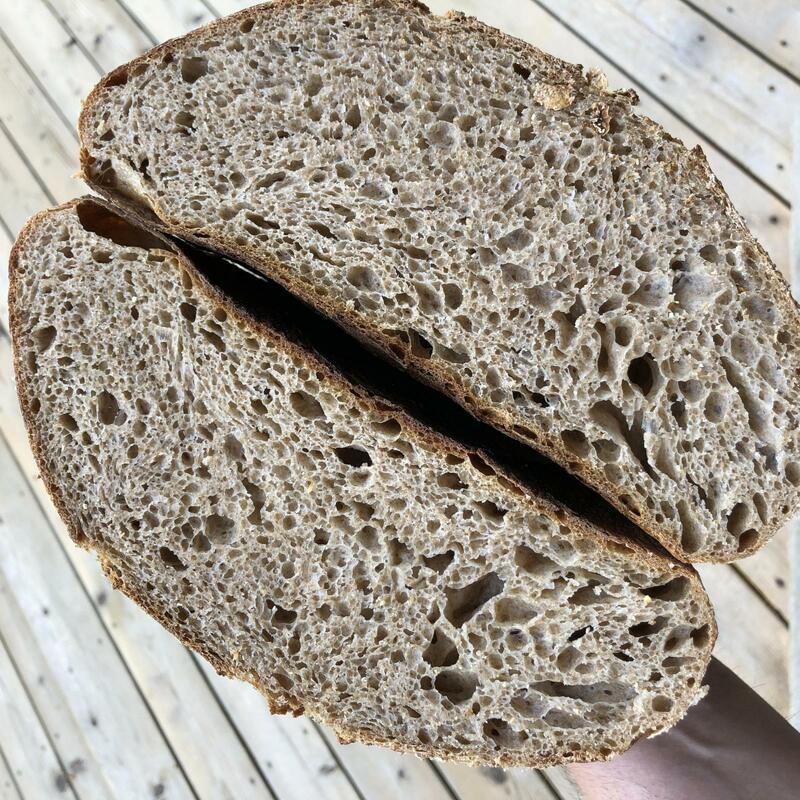 The crumb is very soft and not too moist. The whole wheat flavor dominates and I don't get a strong sense of the oats and can't perceive the maple syrup. I would definitely dial back the hydration next time and I would probably double the maple syrup. Read more about Pushing additions too far?